The Cabinet Office is "unlikely to take any further action" over a spoof website which parodies its online Preparing for Emergencies advice. The spoof, created by student Thomas Scott, closely mirrors the official site and has a very similar address. 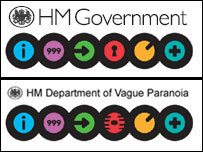 "This could confuse people" claimed a Cabinet Office spokesperson, "and it detracts from sensitive advice". Despite these concerns the spokesperson told BBC News Online that the office would not be taking legal action. Mr Scott has already been asked by the Cabinet Office to remove the website but he refused, arguing that there was "not a chance" that people could be confused. "You couldn't look at it for more than a few seconds without realising it's a joke" he says, "after all, the spoof site is from the 'Department of Vague Paranoia' and offers advice on zombie attacks and alien invasion." Suggestions for dealing with such circumstances include: "Negotiate using sign language, if possible. Failing that, and assuming they aren't armed with futuristic ray guns, run like hell." Under the category of "General advice about what to do in an emergency" readers are instructed to "Remain calm and think before acting, and try to reassure others. Or, trample them in a desperate attempt to flee as the building you're in is consumed by a radioactive cloud". With identical logos and layout, Mr Scott's website looks remarkably similar to the official "Preparing for Emergencies" website which contains all the material contained in the new terror advice booklet distributed by the government. A linguistics student at York University, Thomas Scott has produced a series of other websites, including a parody of the US-Visit information leaflet. He says has received hundreds of emails supporting his latest project and has no intention to remove the offending website. However he has added a link to the official government website. The spoof website looks set to stay online, although Mr Scott jokes he is "half expecting a visit from Special Branch, or at least an OHMS registered letter later!"